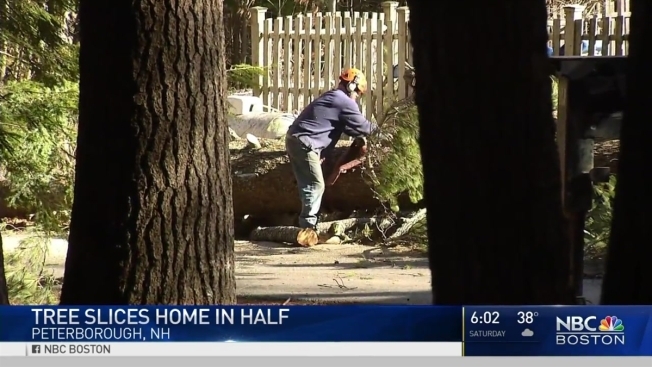 Kevin Carne's New Hampshire house was slammed by a large tree that toppled over due to heavy winds. Mother Nature brought the outside in for a New Hampshire family Thursday morning. Winds toppled a massive tree on top of a home on High Street in Peterborough. "Am I surprised a tree could do this to the house? Absolutely not," said the homeowner, Kevin Carne. "Do I wish it was someone else’s house? Well, kinda." It's the last thing he expected even as he watched the wild weather from his backyard. "It sounded like a sonic boom, it was impressive," Carne said. A tree in his front yard snapped in half and sliced through his home's new addition. "It's a terrifying noise, a tree this size coming down on your house," Carne said. "You kind of dive and get out of the way as it comes through the roof." And the path of destruction didn't stop there. Officials in Peterborough got at least 10 calls for down trees between 9:30 a.m. and 2 p.m.
"It was like a big rumble, a big crack, and a big smash," said one Peterborough resident, who didn't want to be identified. We met her as she waited for a rental car company in the parking lot of her job. Her car was crushed by a falling tree. "This morning it was sunny, then it snowed, then it was like we were having a sandstorm, and the next thing you know, trees were coming down," the woman said. "Good thing no one was in it, that's all I say." Carne feels the same way. "It's scary, it really is," he said. "It's a great relief, it's just what do I do now and how do I straighten it out?" Carne is fully insured and he plans to rebuild as soon as possible. The deputy fire in chief in town says through all of Thursday wild weather, nobody was hurt.